Salam. Perhaps ten years ago in the late 1990’s when my Arabic was even weaker than it is at the moment, I along with a friend attended some lessons of the ‘Ikhtiyar’ taught by the Syrian Hanafi jurist Shaykh Ahmad al-Jammal in Amman. We caught the tail end of his lessons on the chapter of Hajj, where at at the chapters completion he made mention of a book by Nawab Siddiq Hasan Khan which contained an account of his difficult and arduous Hajj journey from India. Shaykh Ahmad commented that this account he had read could have easily resembled a work of fiction, such were the incidents that took place during Nawab Siddiq’s journey, and highlighted how difficult it was in the past to undertake the Hajj and return back to ones homeland safely. The name of the book had stuck in my mind all these years, and recently I was finally able to locate a copy of this work entitled ‘Rihla al-Siddiq ila Balad al-Atiq’. I will try to post if possible (Inshallah) Nawab Siddiq’s comments attempting to describe what he felt when he first set eyes on the blessed Kabah, and what he experienced in his stay in Madinah the Illuminated. For now I leave you with what he mentions in his book about living and dying in Madinah, May Allah Taala make us worthy of such a blessing, and grant us the dust of al-Baqi, Ameen. Note: The story of Nawab Siddiq Hasan Khans journey is the final chapter of the book, he preceded it with a discussion of the legal rulings of Hajj and other related matters. And this version was mentioned by Ibn Hibban in his Sahih. It was also reported by al-Tabarani in al-Kabir with a Hasan chain, al-Tirmidhi said: This is a hadith which has a Hasan Sahih Gharib chain. 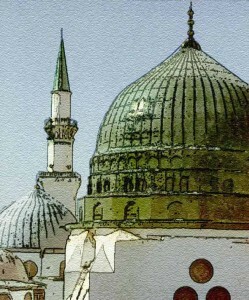 O Allah, make Madinah beloved to us like our love for Makkah, and more! Reported by Muslim, and it has other wordings mentioned by the authors of the Sunan works.